We chose this 4 star hotel as we were attending a conference in April 2014. This was the second part of our trip to LA, after 2 nights in Santa Monica. We were excited to see what it was like being situated in the centre of Hollywood, almost next door to the Chinese Theatre and literally above the Walk of Fame. Inside the lobby was quite calm and serene in contrast to the buzz of tourists outside. Check In was great, we were offered an upgrade to a suite for $60 a night which we took and were pleased we did. We made our own way to our room with the luggage, though help was offered. It was on the 17th floor with amazing panoramic views over the city. Rooms on the opposite side of the corridor had an equally good view of the Hollywood Hills. There was a huge comfortable super king size bed and the bed – side lamps had plug sockets and light switches built in which was really handy. There was a living area with plenty of seating and a great desk looking out over the view. There was no bath unfortunately, but there was a huge rain shower which was luxurious, everything was well appointed, clean and towels and toiletries were plentiful. There was a small rooftop pool which was in a novel spot, feeling like you were in amongst it all, together with a well stocked gym. We ventured out of the hotel to find some lunch, you can gain access directly into the adjoined mall which was handy. Being a busy tourist location it was mainly burger places in the immediate area – Jonny Rockets, Hard Rock café. We tried Jonny Rockets which was just steps from the hotel and was cheap and cheerful. The crowds outside the hotel were slightly off putting but leaving from the rear and into a taxi was quite straightforward, apart from the heavy traffic at peak times, but we suppose that’s LA. We did a lot of walking in our 3 night stay, you can’t hail a cab in LA so you can end up a bit stuck at times. We used Uber quite a few times, this is an app you download to your phone and you can see available drivers in your area, you can choose the type of car you want – a normal saloon or an SUV then choose where and when you need picking up. They take your credit card details when you get the app so there’s no need for cash to pay the driver and when we used them within a few minutes (if not seconds) someone was there to pick me up – like having your own driver! We used Uber to get back to the airport and actually found it better value than a normal taxi. We attended an internet conference in the Dolby Theatre next door, the food/ hospitality were good, not out of this world but good for a conference. Otherwise, we had room service one evening which was OK as far as room service goes – came within 30 minutes. We had breakfast in the hotel too which was disappointing, they forgot my order which meant we were eating at separate times, it was overpriced too for the standard, this was the only disappointing thing we can say about the hotel. Yamashiro Hollywood was a restaurant that was recommended to us up in the Hollywood Hills, it was a steep 10 minute walk from the hotel but was definitely worth the view from the top, the food was great too, Asian style and good for people watching. We think for a conference or for tourists keen to see all the Hollywood attractions – Madame Tussauds, Walk of Fame, Dolby Theatre, Chinese Theatre then this is a perfect spot and we would not hesitate to recommend it. However staying in a more relaxed area of the city, or even on the coast and traveling into Hollywood for the day might be more pleasant as the crowds can get annoying – it depends what you are looking for. 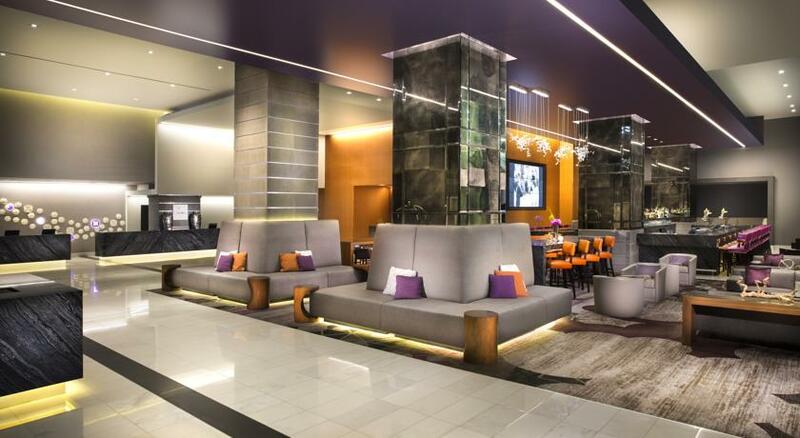 Featuring a rooftop pool and a sun terrace, this Hollywood hotel is adjacent to Dolby Theatre and TCL Chinese Theatres. All luxurious rooms are equipped with iPod docking stations. A restaurant and a full service spa are on site. A flat-screen cable TV with pay-per-view channels is provided in each guest room at Loews Hollywood Hotel. 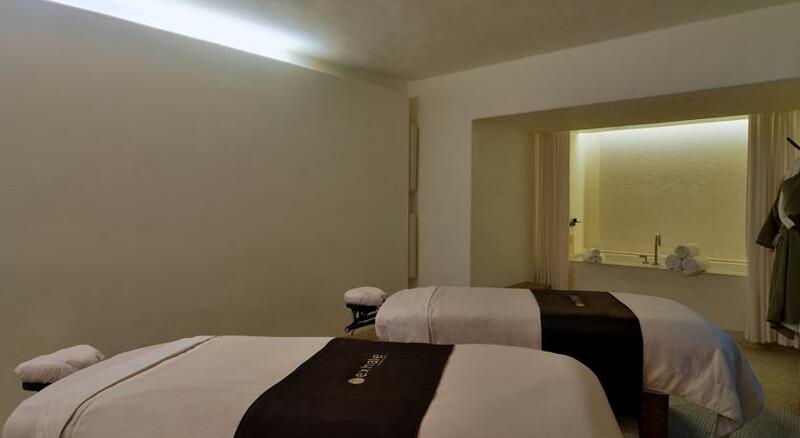 All of the stylish rooms include a work desk, a minibar and a coffee maker supplied with gourmet coffee and tea. 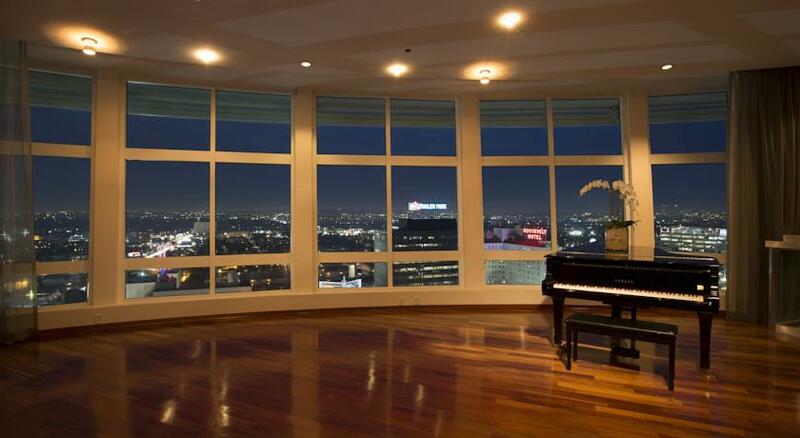 Select rooms offer views of the Hollywood Hills. 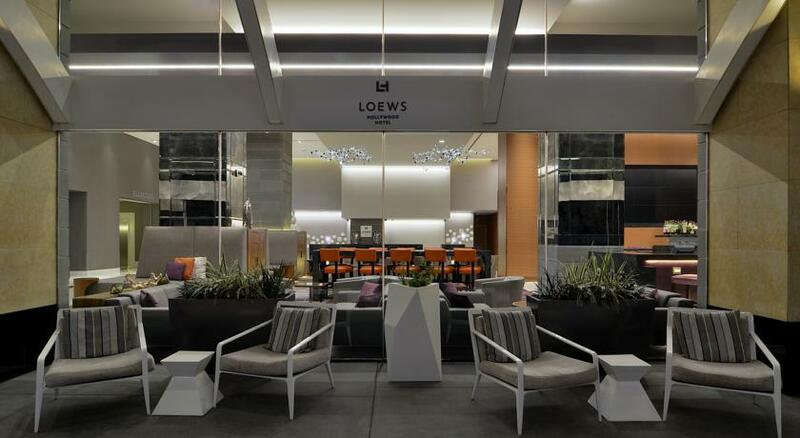 Offering a California-eclectic menu and signature cocktails, H2 Kitchen & Bar is located at Hotel Loews Hollywood. The restaurant prepares entrees using locally-grown products and farm fresh ingredients. There is a quick grab-and-go market, with artisan pastries, pressed juices, and luxury candies and chocolates. 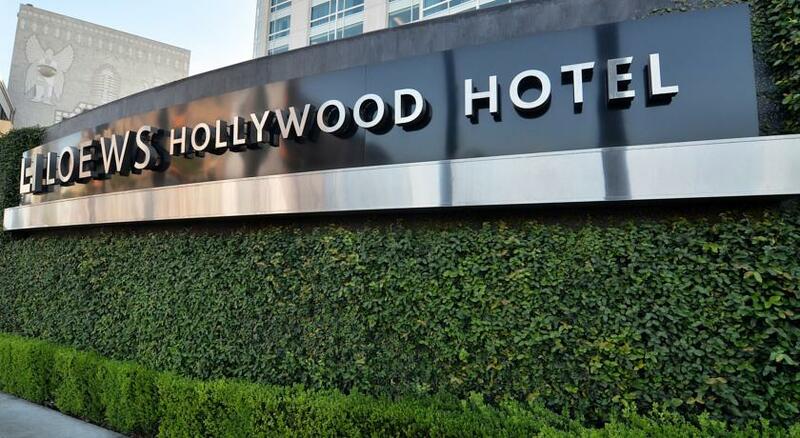 The Hollywood Walk of Fame is less than 1 minutes’ walk from this hotel. The Hollywood Bowl is 6 minutes’ drive away. Los Angeles International Airport is 25 miles away. Whether it’s work or pleasure that brings you to the City of Angels, you’re sure to appreciate a luxury Hollywood guestroom that’s the perfect union of form and function. Think modern with Mid-Century touches. It starts with ample space; but what’s outside is just as spectacular as our sleek, fresh guestrooms. 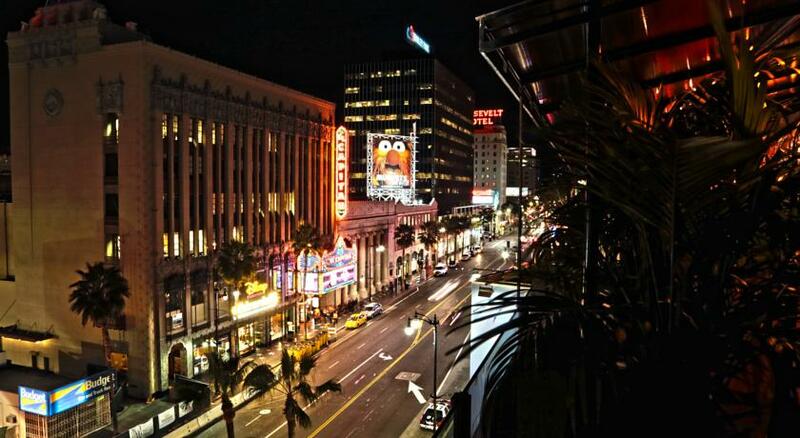 With 20 floors, Loews Hollywood offers views that are hard to match among Hollywood hotels. Prepare for jaw-dropping views of the fabled Hollywood Hills, the iconic Hollywood sign, the glittering lights of our city skyline and iconic L.A landmarks. Here for business? You’ll appreciate the well-designed workspace with an ergonomic desk chair and the handy USB ports built into the furniture. And we’re sure every guest will get behind our complimentary Wi-Fi.